An ongoing discussion of one man's methods, successful and otherwise, for brewing beer in a bag. My busy life has kept me from posting much in the last months, but I wanted to share a new brewing setup that I am hoping proves to be where I'll end up. For the last several years, I have used the BIAB method with great success. My setup includes a 10 Gallon Aluminum pot, and a homemade 4500W heatstick with control box. It makes great beer, but I've become tired of lugging around the heatstick with the 10 foot cable and box. It's just not "elegant". Recently, I came across some posts discussing induction cooktops, and their applicability to brewing. Since I had always used a 4500W heatstick, I figured I'd need to find something close in wattage to provide enough energy to boil 7+ gallons of wort. The forums mentioned an Avantco IC3500 (3500W), and also a Max Burton 6530 (3000W) induction cooktop. I was fortunate enough to find a non-working Max Burton 6530 on ebay for $50, and was able to repair it. The one catch is that my aluminum pot was not going to work, as induction cookers operating by magnetically inducing a current in the cookware that heats the pot and it's contents. Aluminum does not work. 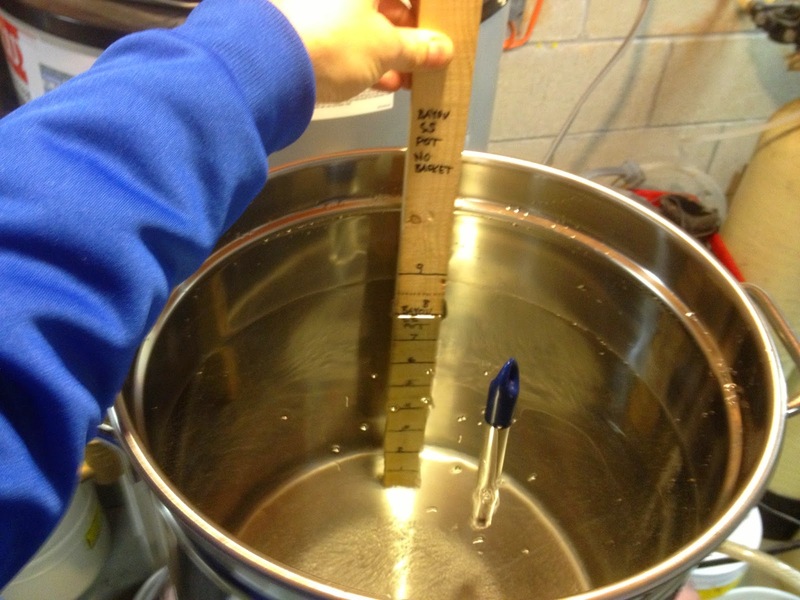 A stainless steel pot was needed, but not just any stainless steel will work. After buying a 10 gallon pot, I realized it was not compatible, so I had to sell it and start over. The forums mentioned that any pot that a magnet sticks to should work, and Bayou Classic pots had worked for some, so I ordered a 1144 pot (10 gallon pot with steamer basket). In these pictures I did not have the steamer basket in, and it was prior to my drilling a hole for my valve. March 2015 - I had started this post in 2014 and am just getting around to publishing it. Since then, I've used this set up with great success. 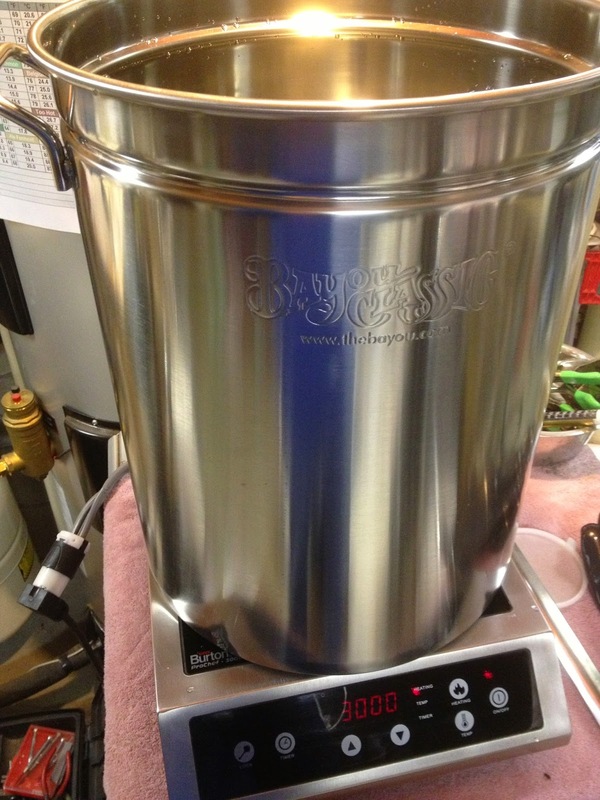 My brewing partner has started using induction plates also (he purchased 2 of the Avantco 3500W plates). I've even become proficient at repairing these, as we've (for various reasons) had a few components blow. One suggestion I have is to avoid any downward pressure on these cooktops, aside from the weight of the water. During one of my first brews, I had sat my grain bag on a rack that was across the top of the pot to let it drain. Then I started pushing down on the bag to try and squeeze more wort out. Later I found that the glass surface on the plate had cracked. I repaired it using JB Weld (love that stuff! ), but to be safe, I ordered an 18" by 18" Silicone Rubber sheet off ebay ($18) and I now drape that across the heatplate, and under the pot. It has turned a little brown from the heat, but has not melted (silicon rubber has a melting point of 300 deg F or more, I think). This keeps any liquid that might find its way to the surface of the heatplate from leaking into the unit. Water and electricity are not a good combination! As always, let me know if you have any questions. I will try and post a few more pics of my complete setup as it exists now. HomeBrewFinds - Daily Deals on Brew Stuff! The bag is the key to BIAB! What's inside my Electric Brewstick Controller box? Living on 2 acres in rural Harford County Maryland, I'm a 48 year old husband and father of 3 who started brewing in 2011. I got into the hobby thanks to my brother-in-law who passed on some homebrew equipment from a friend of his who was getting out. After reading about Brew-in-a-bag, I was intrigued by the simplicity and low cost of entry into all-grain brewing using this method. A contrarian at heart,I enjoy being the only BIAB'er (with an electric heatstick to boot!) in my brew club, advocating it to anyone who will listen.